Established by the North Carolina legislature in November 1777, Washington County came from western territory known as the Washington District. This first county included the whole territory within the boundaries of what would become Tennessee. Jonesborough, the first town in Tennessee, was selected as county seat, and in 1779, construction began on a log courthouse covered with clapboards. Hunters came early to Washington County. Daniel Boone left tangible evidence of his hunting forays in the Boones Creek area, where settlers found a tree that bore the inscription, “D Boon cilled a bar on tree 1760.” William Bean and his family became the first permanent white settlers in Tennessee in 1768-69. Jacob Brown, who migrated from South Carolina to trade with the Cherokee Indians, later bought from the Indians thousands of acres of land on the Nolichucky River in 1775. Following North Carolina’s cession of western lands in June 1784, settlers west of the Appalachians found themselves without government. They remedied the situation by organizing the State of Franklin at Jonesborough in August 1784. John Sevier became the governor of this “Lost State,” which continued until 1788. Not everyone recognized the legal authority of the new state, and a long-lived, bitter political rivalry emerged between Sevier and John Tipton, who supported the jurisdiction of North Carolina. Early settlers quickly organized religious congregations and founded educational institutions. Tidence Lane organized Buffalo Ridge Baptist Church in 1779, the first church in Washington County. In 1780 Samuel Doak founded Martin Academy, now Washington College Academy, and established Salem Presbyterian Church in the same year. In 1789 William Nelson built on Knob Creek Road the first Methodist church, known as Nelson’s Chapel, where Bishop Francis Asbury was a frequent visitor on his circuits through the region. The Quakers located their first meeting house near Telford, probably around 1800. German settlers on Knob Creek organized the first Church of the Brethren at the home of Deacon Joseph Bowman in 1799. The Immanuel Lutheran Church near Cherokee Creek and the Lamar community were established between 1800 and 1805. A revival meeting conducted by James Miller resulted in the founding of the Boones Creek Christian Church in 1825. Washington County attracted several men associated with later state and national history. Andrew Jackson crossed the mountains and settled in Jonesborough briefly, living in the home of Christopher Taylor in 1788. While living in Jonesborough, Jackson passed the bar exam before migrating westward to the Cumberland settlement. Quaker settlers Thomas Embree and his son Elihu became well-known advocates of the abolition of slavery. In 1819, while living in Jonesborough, Elihu Embree published the first abolitionist journal in the United States. First called the Manumission Intelligencer, its name was changed to the Emancipator in 1820. To improve transportation, Dr. Samuel Blair Cunningham of Jonesborough actively sought the completion of the East Tennessee and Virginia Railroad, which was accomplished in 1857-58. Recognizing the potential for development along the railroad, Henry Johnson purchased a half acre of land along the right-of-way in 1854, where he constructed a station and a water tower. Settlement around the station led to the chartering of the town of Johnson City by the State of Tennessee in 1869. Like other northeastern counties in Civil War Tennessee, Washington County was Unionist. A number of skirmishes were fought in the county, and Jonesborough served as headquarters for both Union and Confederate troops. Evidence of the residents’ divided sentiments is readily available. The Bell-Herrin House, with its trapdoors and tunnels, is thought to have been a station along the Underground Railroad. Confederate General A. E. Jackson made his home in Jonesborough and is buried in the old cemetery. Landon Carter Haynes, a Confederate senator, lived in the former home of Colonel John Tipton. The Tipton-Haynes farm is now a state historic site near Johnson City. After the war, both blacks and whites worked to rebuild the region. Hezekiah Hankal, a former slave, became a respected physician and teacher as well as the organizer of many Christian Churches. In the 1880s northern industrialists invested in ventures at Johnson City. General John Wilder, a former Union general in the Civil War, built a furnace to process iron ore from the Cranberry Mines in North Carolina. The ore was transported via the East Tennessee and Western North Carolina Railroad, completed in 1882. In the early twentieth century, capitalist George L. Carter constructed the Carolina, Clinchfield and Ohio Railway, and in 1911 he donated 120 acres in Johnson City for the location of a normal school, now East Tennessee State University. In 1974 the state established the Quillen College of Medicine at the university. In 1901 U.S. Representative Walter P. Brownlow was instrumental in securing for Johnson City one of the first National Homes for Disabled Volunteer Soldiers. Now the Veterans Administration at Mountain Home, this complex is situated on 200 acres of land and occupies fifty buildings including a historic Carnegie Library and the Quillen VA Medical Center. As Washington County approaches the twenty-first century, it embraces its heritage and displays a pioneering progress. 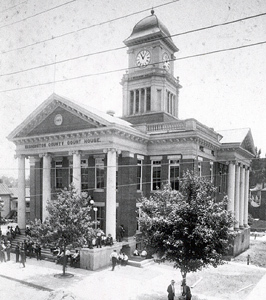 In 1969 Jonesborough became the first historic district in Tennessee. In 1973 the Jonesborough Civic Trust sponsored a storytelling festival that has developed into an annual event of national importance. Politically, the county has established a number of “firsts”: in 1961 May Ross McDowell was the first woman to be elected mayor of Johnson City; she was followed in 1976 by Grace Haws, the first woman to become mayor of Jonesborough, and in 1988 Kevin McKinney became the first African American mayor of Jonesborough.